The Schedule – Sunday night features include internationally known poets, local talent and the ever popular slam. 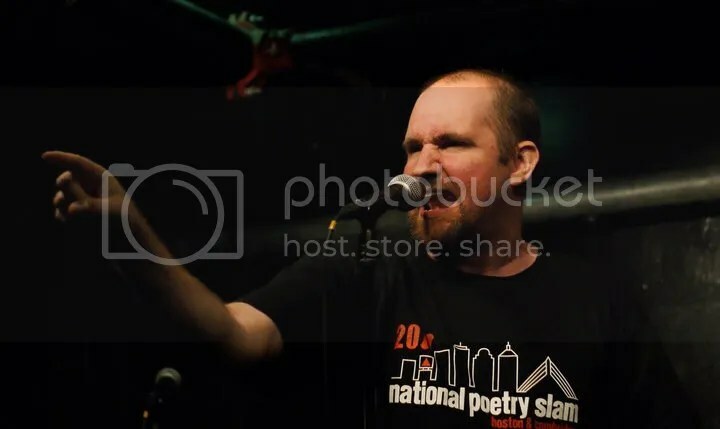 Steve Subrizi lives in Massachusetts and has performed poetry and music across America by himself; with Emerson College’s first slam team, the Gringo Choir; with former New Hampshire slammaster Sam Teitel; and with his band, the Crazy Exes from Hell. He just put out his solo project, called Home Alone Forever. His poems have been published in such places as Muzzle, Neon, and PANK. Doors at 6:30, show at 7 – all ages and free free free; coffee and snacks by donation. Adam Stone has been involved in slam since he misread an academic schedule in 1998 and wandered into a poetry club by mistake. 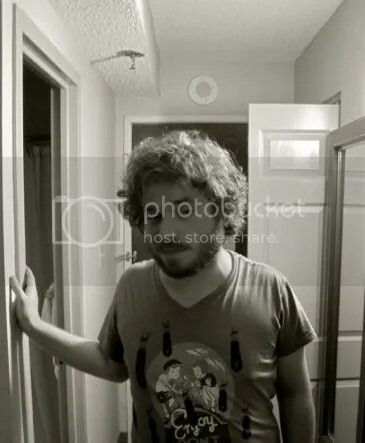 Since then, Adam has represented venues at the National Poetry Slam twelve times, and for a variety of cities He bartends at the Cantab, where he was trained by the illustrious Judy Griffin; he has tried to remain true to her visions of overpouring, overlistening, shushing loud people, and occasionally saying something inappropriate regarding the people on stage. Adam currently curates the venue’s weekly writing prompt series, Tips from the Bar, runs a most-weekly writers group called The Crooked Treehouse, and in 2012, he edited the 20 Years at the Cantab Lounge Anthology which celebrated… Well… The twentieth anniversary of the Boston Poetry Slam at the Cantab Lounge. He’s also been published in the 2013 Flicker & Spark Anthology of Queer Writers. In his increasingly spare time, he also works for a comic book store, Million Year Picnic, and has a graphic novel selection that worries many potential suitors. Doors at 6:30, show at 7 – all ages and free free free; coffee and snacks by donation. On Sunday, October 13, 2013,The Worcester Poets’ Asylum will be closing up shop. After nearly two and a half decades of weekly open mics, we are going on an extended hiatus. We will be back someday in some form. We promise. For now, however, it is time for us to bid the New England poetry scene a very fond “see you later.” But if you know The Asylum, you know that we aren’t going out without a very big bang. As a tribute to the last twenty-four years of weekly poetry open mics and slams in the city of Worcester (that’s roughly 1,250 readings for those of you playing along at home), we are holding one last big show. For one last night, we are pulling out all the stops. One last hurrah! Once more with feeling! Once more into the breech! Many of The Asylum’s past regulars, staff members, team members and features will be there to read and tell stories. All of the Poet’s Asylum merchandise that has been made over the years will be sold. All of the insane recipes that our refreshments team has been too scared to try will be baked and served. A portion of the profits from the event will go towards settling all of The Asylum’s accounts. Whatever is left over will go to benefit our home base for the last two years: Worcester’s only community radio station, WCUW. This is it, kids. If you are looking for a way to show your support of a slam that has given so much to the New England scene, this is your chance. We hope you can all come through and show your love for this legendary New England reading. Doors at 6:30, show at 7 – all ages and free free free; coffee and snacks by donation. Sarah Sapienza handles the booking and schedule for the Poets’ Asylum. If you are a touring poet who will be in the area please drop a note to booking@poetsasylum.org to see if we can work something out. Sign-up for the open reading starts around 6:00 p.m. The list can fill up quickly so get there early if you want to be assured a spot. The reading usually starts between 6 and 6:30 p.m. Remember though, the reading is run by poets and sometimes we have a very relaxed relationship with time. There’s a five minute limit for each open mic reader. Share up to 2 poems during the open mic as long as you don’t go over the 5 minute time limit. Two haiku count as two poems. You can always come back next week to share more of your work. There’s a microphone, although whether or not you use it is up to you. The space we’re in eats sound so it’s suggested that most folks make use of the mic. No musical instruments, please… although on RARE occasions the host might allow it for a change of pace. Best to ask ahead of time. Have fun!!! We do what we do because we love it… we hope you love it too… so don’t be afraid to show that. Hi ! I think I may have found something in my area to present my poetry. I have been sharing my work with a venue in the UK;https://www.facebook.com/42openmicnight, and have been touted as their first international poet. I have been looking for a home based group I can share my work with, and would love to make new contacts on FB. Do you have a FB link to your fan page? Thank you, As soon as I can shake this nasty flu, I am looking forward to it! Although I have been read at open mic nights in the UK, I have yet to read my work. I am excited to find you:) You have no idea. Everyone told me Worcester no longer did venues. That spoken word and coffee shop artists were a thing of the past. Boy, wait till I tell them! I’m new to the area- I’m working in Rutland for 6 months and would love to get involved in the Worcester slam community. However, I don’t have any way to get to Worcester. Is there anyone in Rutland who could give me a ride to any of the Sunday night slams? I work just outside of Rutland. Let me know, I’d love to be able to slam.